In the 2012 general election, young people turned out to vote in droves, with numbers similar to the historic turnout in 2008. In California, this vote helped drive Proposition 30’s resounding victory, preventing huge additional cuts to higher education. The role of students in this victory expanded beyond simply turning out to vote. Students helped propel Prop. 30 by spreading the word on college campuses, over the phone, in the press and through social networks. Given the results we saw in November, it is clear that students have a significant role in addressing the ongoing financial challenges facing California’s colleges and universities. But the time for celebration has passed — now is the time for redoubling our efforts on two similar fronts: increasing state support for public higher education and building greater transparency and accountability from university administrators to ensure resources are wisely spent. In Sacramento, we have a new opportunity to overcome the structural hurdles that have undermined prior efforts to protect affordability, accessibility and quality at the University of California. For the first time since the 19th century, Democrats have won a two-thirds supermajority in the State Legislature. This means that new proposals — like a tax on millionaires and reform of Proposition 13 — could gain new consideration and ultimately help get California and its universities back on track toward financial sustainability. We also have the opportunity to pass new measures that ensure state dollars are focused on students and classrooms. But not if we sit passively on the sidelines. As students at UC Berkeley, we also must do our part to hold university leaders accountable for their spending priorities and financial decision-making practices. 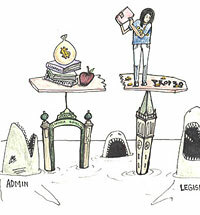 In recent years, university administrators have taken controversial and costly actions, including engaging in risky debt privatization deals with Wall Street firms and granting lavish raises to top UC executives. The resources used for these actions could have been spent to offset student fee increases or ensure better staff-to-student ratios. Students have a very significant role to play in leading the way to long-term reform at the University of California. From advocating for sustainable financial support at the Capitol to speaking out against poorly allocated financial resources, the voices of students must be heard and the voices of students must be strong. We mustn’t forget how much is at stake — not just for today’s students, but for future generations of Californians. The University of California provides important research and economic value to the state, educates the populace to be both more employable and civic-minded and remains a leading reason why people move to California from other states and countries. More directly, the university is the third largest employer in the state. The thousands of employees at each campus keep the university running and ensure that it remains an essential engine driving California’s economy and civic life. It is clear that the students and workers of the University of California have a vested interest in a future for the institutions that work for them. This means that our work is not finished. As students, it is our duty to ensure that university funding is used responsibly and that the University of California remains intact as an institution to cultivate students and build the future of our state. We’re asking you to stand with us and take ownership of the university to make sure that neither legislators nor administrators squander the new opportunities we won in 2012. We want to make sure your voice is heard. By completing our survey, you can send a message to the UC Board of Regents. You can also find us tabling on Sproul Plaza, where we will be discussing the dynamics of the state budget so that we all have the knowledge and wherewithal to influence how our tax dollars are spent. Nicholas Kitchel is Chief of Staff for the California College Democrats.